AMD has discretely revealed the Radeon PRO V340 — a dual Vega 10 multi-GPU card with 32 GB HBM2 memory. The Radeon PRO V340 is being targeted for virtualization applications with support for up to 32 concurrent users and hardware encode capabilities for H.264 and H.265 video while providing a built-in security processor for isolating the virtualized environment from the cloud provider. 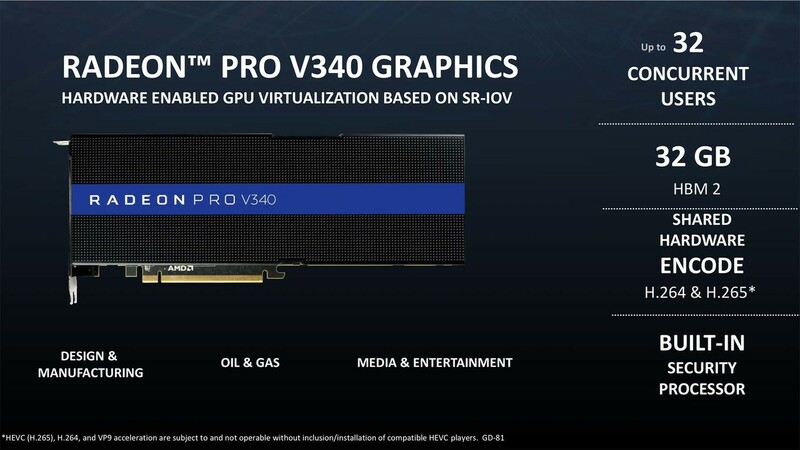 A slide deck showing AMD's plans for the HPC and virtualization markets showed a new GPU in the works — the Radeon PRO V340. AMD never spoke about the existence of this GPU during its 7nm Vega unveil at Computex this year so this comes as a bit of a surprise. The Radeon PRO V340 is reportedly being aimed at the virtualization market and cannot be used as a conventional desktop GPU as it lacks display out ports. Although not much is known currently about the Radeon PRO V340, the intriguing aspect of this GPU is the amount of memory it boasts of — a whopping 32 GB of HBM2 memory. This has led to speculations that this could be based on the 7nm Vega platform that AMD demoed at Computex earlier this month. But if that were to be the case, then AMD would have shown this card alongside the Radeon Instinct that was also directed towards HPC use cases. This leads one to infer that this could either be a Vega 10 that is equipped with higher density memory stacks or a dual Vega 10 setup with 16 GB HBM2 memory for each GPU. The card can thus support up to 32 concurrent users and can effectively encode H.264 and H.265 video. The clue lies in the drivers for this card in which it is codenamed AMD686C.4 or AMD Radeon PRO V340 MxGPU. The MxGPU implies that this could be a multi-GPU solution. The slide also mentions the availability of a 'security processor' possibly to isolate the virtualized environment from the cloud provider. Apart from the fact that the Radeon PRO V340 offers hardware-accelerated GPU virtualization based on SR-IOV, not much is revealed about the card and the rest of the presentation by Nick Pandher, Director, Market Development and Professional Graphics at AMD, was mostly about other Radeon offerings for pro users. It would be interesting to see how a dual Vega 10 setup fares but in all likelihood, it would be of little use for the consumer market. Such cards, however, can be of immense benefit in applications such as oil exploration, molecular modelling, medicine, AI etc.